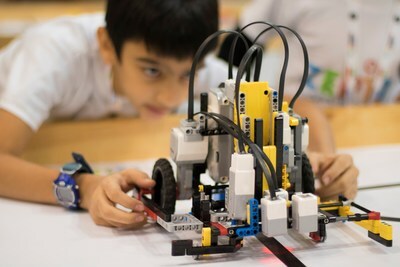 SINGAPORE, April 12, 2019 /PRNewswire/ -- World Robot Olympiad is a challenging and fun way to interest young people in robotics. Now, a new season of global competitions is being announced with the support of premium sponsors LEGO® Education and Juniper Networks, an industry leader in scalable and secure networking technology. The competition consists of a range of different categories aimed at young people and university students. Robots in each category must complete a series of challenges in line with a topical theme that changes each year. The overall mission is to promote STEM subjects - science, technology engineering and math - and to inspire the innovators of tomorrow. "From small beginnings, World Robot Olympiad has become a way to get young people interested in robotics, no matter where they live in the world. For example, children from Costa Rica, Palestine and from townships in South Africa have successfully taken part in past International finals and brought their unique perspective to the common challenges being addressed . This is a way to promote robotics to diverse audiences, while building an interest in the STEM subjects and in working together to solve a problem. We all learn together and create an experience to remember." "At LEGO Education, we strongly believe in the power of playful, hands-on learning. We deliver amazing learning experiences that will prepare today's children for the world and careers of tomorrow. We deliver STEM based learning that encourages children to get hands on with the learning experience, engaging both hands and minds. Through WRO, students get a learning experience they will remember for the rest of their lives, and we are proud to be part of enabling this. Participating in WRO really helps students develop confidence in STEM, as well as many of the 21stcentury skills that are so important for the workforce of the future, such as collaboration, critical thinking, problem-solving, communication and creativity. The rules of the WRO categories encourage students to create unique approaches, and the idea that there is not one single "right" answer or solution to a problem really fits our learning philosophy. The same can be said of the international aspect of WRO, enabling students to connect across boarders through STEM and Innovation." "Juniper Networks is focused on engineering simplicity to solve some of the world's most challenging networking issues at a time when automation and digital transformation are revolutionizing many aspects of our daily lives. In World Robot Olympiad, we see teams of young people using technology to simplify, problem-solve and innovate in a similar fashion. Juniper is therefore convinced that the young people who take part in these competitions, at every level, are being given a unique opportunity to nurture key skills that will help transform the world of tomorrow." "As the reindustrialization of Hungary has reached a new level with turning the focus of investments towards high tech industries, a new level of need for highly trained human capital has also been reached, recognized by the Digital Success Program of the Ministry of Innovation and Technology. Sectors of the economy related to Industry 4.0 are seeking employees with new sets of skills and knowledge. Problem solving, cooperation and creativity are in the highest demand, but first of all, coding, algorithmic thinking and engineering have become general requirements in most of the economic sectors, not only in IT. World Robot Olympiad has them all. The WRO competition simultaneously develops these skills in an engaging way. WRO can show purpose and opportunity for children and can prove that robotics, engineering and coding can not only be fun, but at the same time a fantastic career option. I am proud that our government supports this incredible competition which paves the way for the future." World Robot Olympiad Association (WRO) is a nonprofit organization. Its mission is to inspire young people around the world with a range of robotics competitions and, through that, to take an interest in the STEM subjects. WRO robotics competitions are popular worldwide and each year the WRO International Final brings together young people from around the world to present their solutions to the season's challenges. Additional information can be found at our website (www.wro-association.org). Follow WRO on Facebook and Twitter @WROOfficial. LEGO® Education offers playful learning experiences and teaching solutions based on the LEGO system of bricks, curriculum-relevant material, and physical and digital resources to preschool, elementary, middle school and after school levels. LEGO® Education provides hands-on learning solutions that engage every student's natural curiosity, and helps them develop the skills and confidence they will need in the future. Follow us on Twitter @LEGO_Education.